THIS is Tokyo. Capture the glittering night view of the metropolis. Marunouchi; center of Japanese economy and finance, and Ginza; a district packed with high class boutiques, are both famously sophisticated areas of Tokyo. Enjoy a guided walk through these areas whilst taking in Tokyo's glittering night view, made up of impressive modern architecture, glass office buildings of the business district and the magnificent architecture of Tokyo Station. Your otomo tour guide will take you to the little known, hole-in-the-wall areas as well as the well-known scenic locations. Visit a location at the end of the tour where you can print out your photos and even make an album out of them if you want to! This tour is a must for photography lovers. Travel to Japan and visit Ginza and Marunouchi to enjoy Tokyo's beautiful night views. Tokyo Station, KITTE and the Tokyo International Forum are some examples of what make up the beautiful scenery. 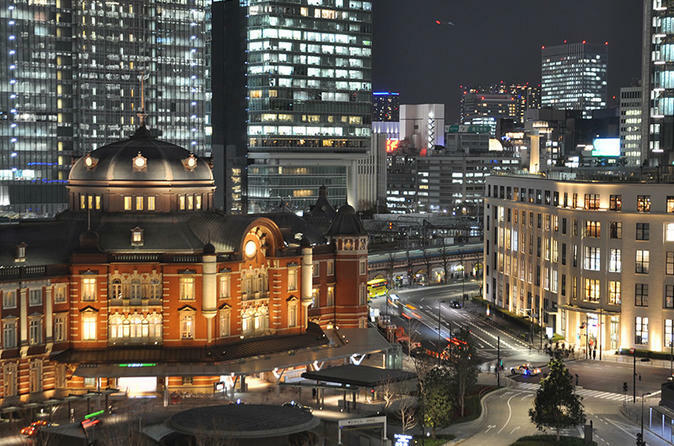 Visit the little known scenic locations in the area surrounding Tokyo Station to enjoy Tokyo's night view. Send letters and postcards to your loved ones. Enjoy a little picnic on a terrace. Take in the view of Tokyo Station from above.